This piece is based in the States where we will send it on from so good news for US buyers. You are viewing an amazing silvered bronze bust showing a male head who\’s hair fans out at the back into a wing. In tune with art decos preoccupation with aerodynamism and its particular take on perceptions of modernity, the figure looks like he\’s seen a ghost in a wind tunnel! 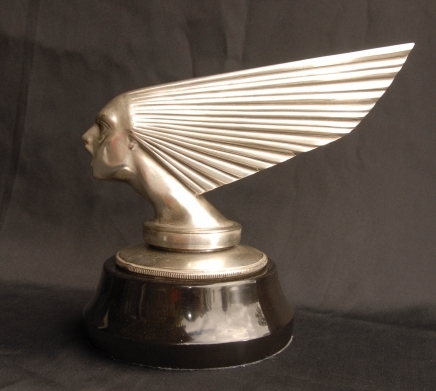 The piece is the epitome of art deco style and elegance and would make a great addition to any home collection. It reminds me of a mascot you might find on the front of a car, like Sykes\’s famous Silver Spirit found on Rolls Royce\’s hoods. The piece is a re-casting of the famous Victoire R Lalique statue. The piece sits firmly on a black marble base which has been polished and so is smooth to touch. The patina to the bronze is also smooth to touch and silvered. 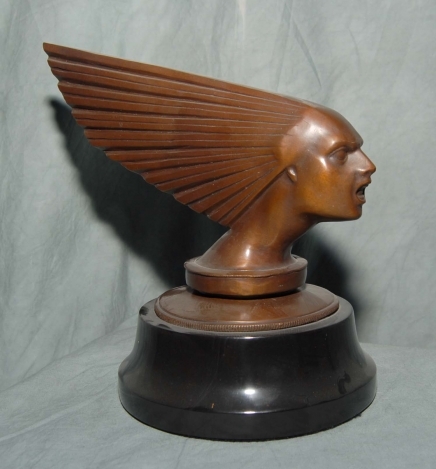 You are viewing an amazing brown bronze bust showing a male head who’s hair fans out at the back into a wing. In tune with art decos preoccupation with aerodynamism and its particular take on perceptions of modernity, the figure looks like he could be in a wind tunnel. The piece is the epitome of art deco style and elegance and would make a great addition to any home collection. The piece is a re-casting of the famous Victoire R Lalique statue. The piece sits firmly on a black marble base which has been polished and so is smooth to touch. The patina to the bronze is also smooth to touch. This piece is based in the States where we will send it on from so good news for US buyers. You are viewing an amazing silvered bronze bust showing a male head who’s hair fans out at the back into a wing. In tune with art decos preoccupation with aerodynamism and its particular take on perceptions of modernity, the figure looks like he’s seen a ghost in a wind tunnel! The piece is the epitome of art deco style and elegance and would make a great addition to any home collection. It reminds me of a mascot you might find on the front of a car, like Sykes’s famous Silver Spirit found on Rolls Royce’s hoods.